Always such a nice way to wrap up the week, counting blessings and good times with Susanne and the girls at Friday's Fave Five. Join us, if you'd like, on your blog or share something in the comments. 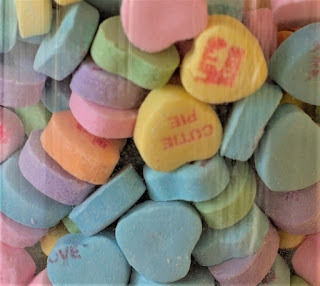 So many things to love about Valentine's Day, especially seeing those pink and red envelopes in the mailbox. I can't help but smile when I see them, each a special treat tucked in with the bills and the ads! 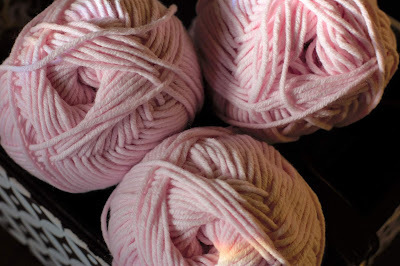 I found the perfect shade of pink yarn for a blanket for our newest grandbaby, due in early June. I started two different patterns, before I finally landed on a third one that I really like. I'm only a few inches in, but it feels perfect. It's blooming again! 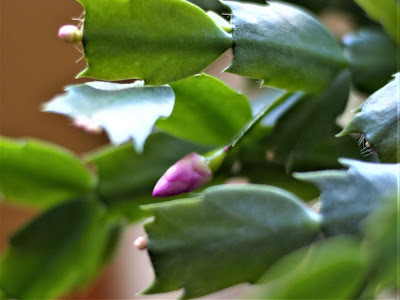 The Christmas cactus that my friend Pam nurtured back to health for me, is just thriving. I'm so tickled whenever I see it come into bloom, like I did something to make it happen. Well, I guess I did, I've actually remembered to water and feed it! Valentine's Day with my Sweetie <3 He loved the favorite dessert I made, and I loved the chocolates he gave me:) We had pizza and wine while watching the movie of my choice -- The Family Stone. It's really a Christmas season movie, but one of my all time favorites. Slow, but steady progress with the Write28Days challenge for February. My goal is to simplify and tidy up around here, just 10 minutes at a time, each day. Some days I'm doing physical tidying up, other days it's a mental challenge. I'm finding some great articles on this list that helps me slow down and smell the roses. You have had some lovely blessings this week, Karen. I loved the Snoopy sticker on the back of that pink envelope. :) Your Valentine evening with your favorite Valentine sounds like a lovely time. :) Chocolates are always good! I love that shade of pink! You sound like me when it comes to trying patterns. I finally gave up and just made up my own. :) I'm not certain if that is called strong-willed or a pioneer spirit. lol It is fun doing the challenge together and hearing of each other's accomplishments as we go along. Happy Friday, Karen! I was so excited to get Valentine's cards from my young granddaughters too, some lovely homemade ones for me from them and a Star Wars, may the force be with you for their PawPaw!And a very sweet one from RH left on the breakfast table, the envelope addressed simply "Wife." I let Bolognese Sauce simmer all day for our pasta supper last night but will make a pie for tonight to go with the leftovers. And we are watching West Wing every night at supper together, unless some kind of sports is on that he can't miss and then I prop a good book in front of me. Oh, and we both love Family Stone! That baby's blanket pink yarn is lovely--I want to caress it! A new grandbaby coming soon is so exciting. How many is that for you now? We have six and two great-grands! Sounds like a beautiful and colorful week my friend! Hmm, I've never seen that movie, Family Stone. Will have to look it up! Your Valentine evening sounds lovely. I like relaxing evenings like that. It is always a joy to get a real piece of mail instead of bills! Hope you are having a nice weekend. Yay for chocolates, pizza and wine with a fave movie. That's what we do for Valentine's too . Lovely shade of pink. I'm guessing a granddaughter on the way lol. Congratulations. I'm also trying to declutter gradually - will be checking out that post when I get a spare moment. Thanks for sharing. Love that shade of pink yarn! Looks like you had wonderful Valentine's Day! I am not good with plants, so I understand your joy at your Christmas cactus blooming. You are doing so well with the writing challenge! I managed ONE day. Sigh. Ooo! The pink yarn! I can't wait to see what you are making for your grandgirl! What a treat to actually get cards in the mail! That yarn is such a soft pretty pink. And yes something about watering those plants that makes them thrive. LOL. I am so not good with plants. I'm always either forgetting or overdoing. Around here it is survival of the fittest when it comes to plants.